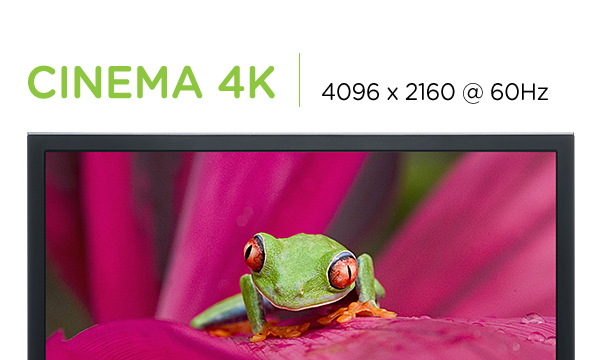 Cinema 4K (4096x2160 @60Hz) - switch with the push of a button. 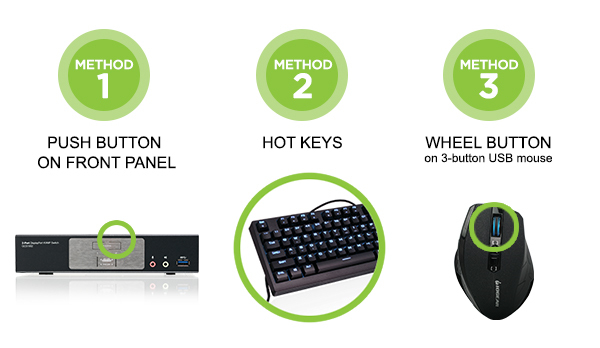 Effortlessly control 2 computers and 2 USB 3.0 peripherals from a single keyboard and mouse. Featuring a revolutionary combination of Cinema 4K resolution, the next generation USB 3.1 hub, and enhanced user-friendly operation, IOGEAR's 2-Port DisplayPort 1.2 KVMP Switch provides the latest innovations in DisplayPort KVM technology. 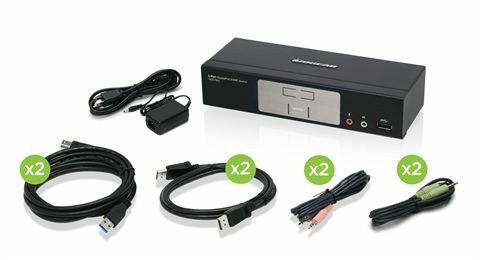 Connect your powerhouse computers and experience Cinema 4K resolution while switching between the two computers and sharing two USB peripherals with the push of a button. 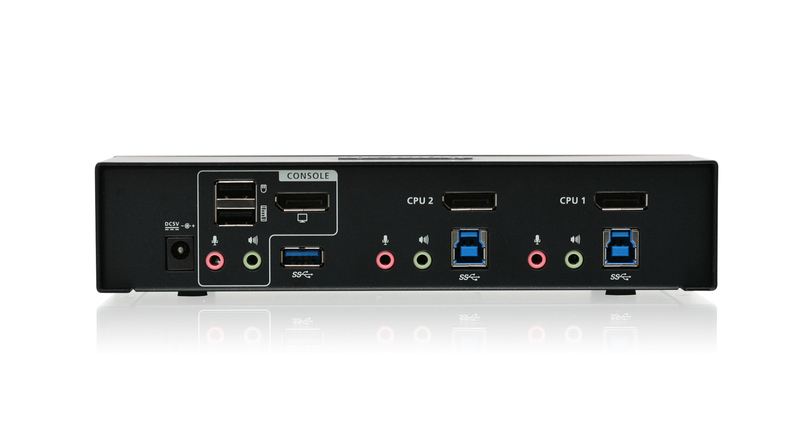 The 2-Port DisplayPort 1.2 KVMP Switch combines the functionality of a KVM switch with a DisplayPort 1.2 digital interface, built-in USB 3.1 Gen 1 hub, and audio. Control two DisplayPort computers with ease using a single keyboard, mouse, and DisplayPort monitor. Expand your USB 3.0 peripherals connectivity with faster data transfer rates and eliminate redundant hardware. The DisplayPort 1.2 KVMP technology delivers up to Cinema 4K resolution standard; 4096 x 2160 at full 60Hz frame rate. 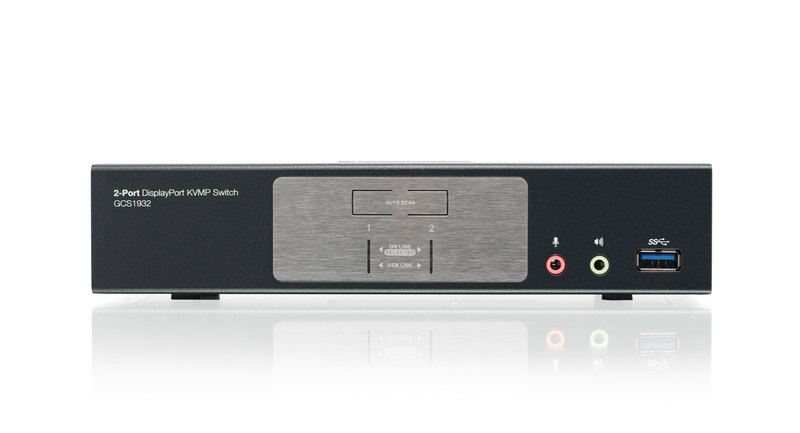 This 2-Port KVMP switch is designed for environments requiring cinematic graphic resolution, such as professional film and video production industries. The IOGEAR DisplayPort 1.2 KVMP switch also enhances consumer electronics applications in motion graphic design, animation, engineering, architecture, and media design. Switch and access two DisplayPort computers from a simple push-button on the front panel or hotkeys combination on your keyboard. IOGEAR's 2-Port DisplayPort 1.2 KVMP Switch also offers the latest mouse port-switching functionality to change ports. Easily switch between connected computers by clicking the wheel button on your 3-button USB mouse. 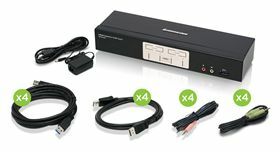 Additional smart connectivity features turn your workstation into a convenient and easy-to-use powerhouse. The Power on Detection feature ensures that this KVMP will automatically connect to the next powered on computer. 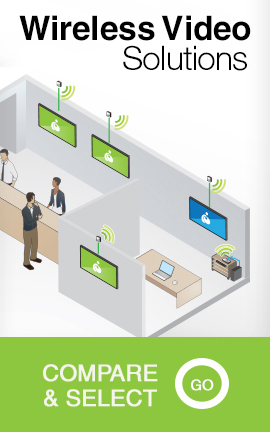 Add up to 3 monitors* for an expanded workstation utilizing MST (Multi Stream Transport) technology. The built in USB 3.1 Gen1 ports allow connectivity of up to SuperSpeed 5Gbps data transfer rates and is backwards compatible with USB 2.0 and USB 1.1 legacy devices. Avoid unplugging and plugging USB peripherals and audio devices between your two computers. Share your peripherals** with the push of a button and forget about purchasing additional keyboards, mice, monitors, hard drives, flash drives, printers and more. 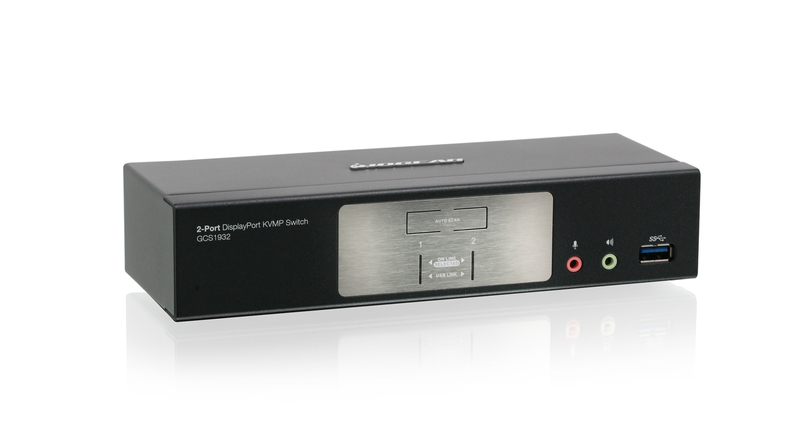 Additionally, straight forward firmware update eliminates the need to purchase upgraded KVMP switches.